Different ways to get something from A to B. 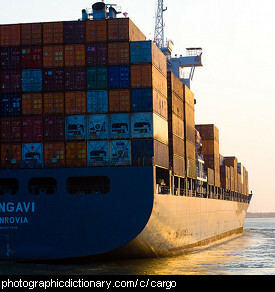 Cargo, also called freight, is goods that are being transported. Cargo is usually being moved so it can be sold. When people talk about cargo they usually mean very large quantities of goods, like the shipping containers full of goods on the ship in the picture. 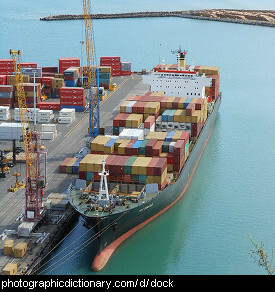 A dock is a place where ships can come up against the shoreline and load or unload their cargo. It might also be a similar system set up for trucks to load and unload. Used as a verb, docking is the act of something connecting to a dock. 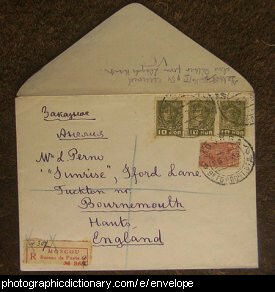 An envelope is a special paper container that you put letters into to send them to other people. It costs money to send a letter. You have to buy a stamp to put on it to send it. 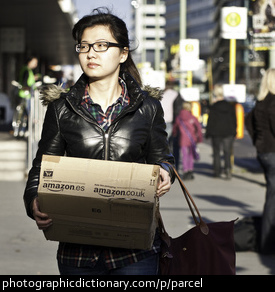 A package is another word for a parcel. 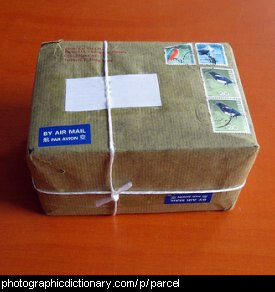 A parcel, or package, is something wrapped up to be sent in the mail. The wrapping protects what is in the package from being damaged. 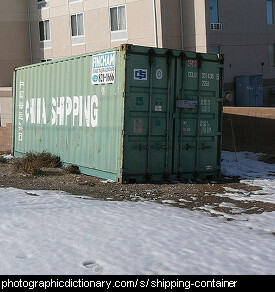 A shipping container is a very large box that is used for transporting goods very long distances. Containers are designed to stack onto each other, and are the perfect size to fit on trucks and trains. You can fit hundreds of containers on a cargo ship.